In early June of this year, Rockford, Illinois, celebrated Rockford Peaches Day—a day to honor the legacy of the All-American Girls Professional Baseball League team and the inspiration for the 1992 feature film, A League of Their Own. The timing was not insignificant—2018 is the 75th anniversary of the start of the league, of which the Peaches were one of four founding teams, alongside the Racine Belles, the Kenosha Comets and the South Bend Blue Sox. Fans of the movie already know the story. The All-American Girls Professional Baseball League (AAGPBL) formed in 1943 as the world was in the throes of World War II. Minor league teams were disbanding and about 500 major league players had headed off to the war. Executives wanted a way to keep the major league stadiums in use if the games ended, so scouts went hunting for female players. The league was initially formed as the All-American Girls Softball League, but halfway through the first season the name changed to the All-American Girls Baseball League. The board of trustees wanted to ensure it was separated from other existing softball leagues as well as major league baseball, since the rules were the same. There was a catch though: softballs were used with underhand pitching and infield distances were shorter, causing a media upset because “baseball” was still in the name. So at the end of that first season, the now popular moniker AAGPBL was adopted. The name changed again a few times over the years as smaller ball sizes appeared and overhand pitching became the norm in 1950, eventually coming back to AAGPBL in 1988, when the Players’ Association formed and sought Baseball Hall of Fame recognition. The movie got almost everything right, Maybelle Blair, one of the original Peoria Redwings players and the inspiration for All-the-Way May in the movie, told Smithsonian.com. The girls were paid salaries of $45 to $85 per week for their time in the league, which was often more than their parents made. Notable major league players and officials managed the teams. Each team was assigned a female chaperone. The uniforms were, in fact, short skirts, and the girls really did have to attend charm school. The league officially disbanded in 1954, largely due to declining attendance and flagging revenue, having seen 15 official teams and more than 600 women players in its time. Now, back in Rockford, the original Peaches home field, Beyer Stadium, is undergoing an extensive renovation. Greg Schwanke, who runs a softball and baseball league in Rockford, spearheaded the project. His goal is to return the stadium as close as possible to its former glory—even including a wooden outfield wall where local businesses can advertise, but only if it’s a 1940s-style advertisement. For now, though, the ballpark is still open as it undergoes renovations, featuring the Rockford Starfires Women’s Hardball/Baseball League. 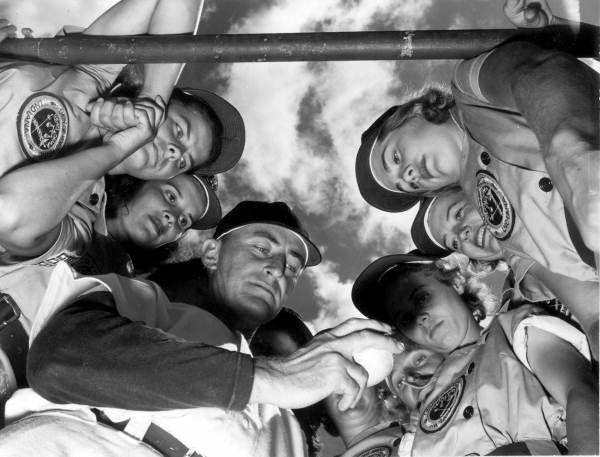 And fans of the Rockford Peaches, the most successful team in the AAGPBL, can explore a quick history walk located just inside the front gates. Simmons Field, former home of the Kenosha Comets in Kenosha, Wisconsin. Marsh Field, former home of the Muskegon Lassies, in Muskegon, Michigan. Robin Roberts Stadium, former home of the Springfield Sallies, in Springfield, Illinois. Horlick Field, former home of the Racine Belles, in Racine, Wisconsin. Memorial Park, former home of the Fort Wayne Daisies, in Fort Wayne, Indiana. Peoria Stadium, former home of the Peoria Redwings, in Peoria, Illinois. Soisson-Rapacz-Clason Field, former home of the Kalamazoo Lassies, in Kalamazoo, Michigan. Bailey Park, former home of the Battle Creek Belles, in Battle Creek, Michigan.